Ron Kraybill blogs at the intersection of conflict resolution and human transformation. 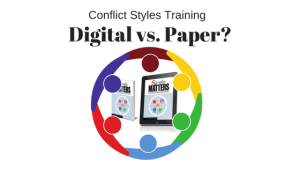 In training with the Thomas Kilmann or my Style Matters conflict style inventories, you have an option to use either a paper or online version. I used to be ambivalent about this choice, but no more. I’m an old-school trainer. I love the simplicity of paper and face-to-face training. But after Style Matters had been out in paper for several years, demand for an online tool drove us to also develop a digital version. That was an eye-opener for me. After dozens of hours honing our scoring algorithm, I couldn’t deny that the score report our server spits out for each user mines the user data in ways I can’t match in a workshop from a hand-tallied score summary. It would take quick thinking and 10-15 minutes dedicated to each participant for a trainer to come even close to the detailed insights contained in the 10 page score report generated by our server. That’s just not realistic with 10-20 people in a workshop. Best of all worlds – digital plus face to face. So I’m a reluctant convert to the digital version of Style Matters. We still sell the print version, but in my opinion the ideal approach in training is to have users take the online version before the workshop, print out the score report at home, and bring it to a live workshop. Then in a face to face setting a trainer takes users through a learning experience that provides some input on conflict styles, reinforced by review and discussion of digital score reports in small and large group settings. Don’t miss the new guide to training with Style Matters Online. To assist this, I recently wrote a new section for my long-standing Trainer’s Guide to Successful Conflict Style Workshops. There’s a lot of trainer guidance in that guide, but it largely assumes the paper version. The new guide presents a trainer’s outline for a workshop using the score report from the online version, including links to a lot of resources to support your preparation. It’ll be in the next edition of the Trainer’s Guide, but don’t wait. Take two minutes to scan it now. The Thomas Kilmann has no comparable guide to my knowledge, but the two are close enough that some aspects of my guide still apply. Get Guide to Conflict Style Workshops for Online Users. Compare Style Matters and the Thomas Kilmann Conflict Mode Instrument. Thomas-Kilmann, Hammer’s ICSI, or Style Matters?